Luxury 5* villa with private pool amazing views, perfect for 2 or 4 guests. This secluded luxury villa is nestled on half an acre of luscious tropical gardens and fragrant bay leaf trees in the hills of Spring Estate. Bay Tree Villa has a fabulous view overlooking a coconut plantation, Spring Beach and the Island of Battowia. Bay Tree Villa is located in one of the quietest locations on Bequia, perfect for peace and privacy, whilst also being only a 15 minute drive from beaches, restaurants and island life. Every aspect of Bay Tree Villa encourages guests to enjoy themselves in any way they choose with a variety of outdoor spaces from the pool and sun terrace to the covered shade deck and BBQ patio. The living area is open plan to the dining room and kitchen with 14ft doors leading to the covered deck for dining or just relaxing. The Living area contains Wi-Fi, large flat screen TV with cable, Bluetooth speaker to connect to your iPod etc. The kitchen is very well equipped with a large fridge freezer with ice maker and water dispenser, dishwasher, microwave, blender, toaster and coffee maker, double oven and gas hob. The kitchen leads out to a secluded patio with dining for 6 and a BBQ grill. The master bedroom suite has a large king size 4 poster bed, a high power ceiling fan and leads out to the covered deck at the front of the villa, a separate dressing room and en suite bathroom with large stone shower. A second master bedroom with either a king size or two twin beds, a high power ceiling fan and walk in closet and en suite bathroom. The villa also has a fitness room for guests to enjoy which includes free weights, an elliptical machine, a floor mat and multi gym. For those guests that seek activity there is plenty on offer from diving, snorkeling, fishing, tennis, hiking, sailing or day trips to nearby islands. Spa services can also be arranged at the villa. Vehicle rental is also available on request. For stays of 7 nights or more a welcome grocery starter package upon your arrival. Parking for 2 cars and covered parking. Electric gates to access the villa. Tim and Suzanne Gabriel Tim's father was born in St Vincent but he was born in the UK met and married Suzanne there. In 1992 three years after being married we were looking for adventure so decided to move to Bequia. Tim worked with the one and only Cable and internet company in the country at that time, from its inception until 2008. Suzanne enjoys her wedding business "A Caribbean Wedding" and is also involved with the Sunshine School - a school for special needs children on the island. We built our first home on the island in 1992 and after realizing that Bequia was so special that we would like to be here for the long term we decided to build a larger home. Bay Tree Villa took 2 years to build. We love the area of Spring, so choose to build not far from our current home. It is so quiet and tranquil, we love the ruggedness of Spring beach and the breezes this side of the Island offers and still only minutes to the islands best beaches or the hustle and bustle of the harbour area. Located in a grove of fragrant Bay Trees looking out over the center of Spring Bay and the tops of the Palm trees you feel that you have your very own slice of paradise. The pool and sun terrace areas are very private and the villa offers many different outside seating areas in the shade and sun. We live next door so you will receive all the privacy or help and advise you require to make your stay a most enjoyable vacation. Quite hillside location but only 15 mins from town. You can just about see the beach at Spring Bay through the Coconut Plantation Palms. About a 10 min walk downhill. Wonderful view of Spring Bay and the Coconut Plantation looking out to sea towards the islands of Balliceaux and Battowia. Ocean views from the upper and lower decks and the pool. You can even see the ocean while in bed. Elliptical machine, multi station gym, free weights, and various small pieces of exercise equipment. Can be rented on the beaches. Available to rent in main town. Fishing trips can be arranged. Or day trips by boat to nearby islands. Huge deck both upstairs and down with loungers and deep seating furniture. Tennis court in harbour available for hire, we have rackets you can use. Private pool for villa guests only. Not overlooked. Sun and shade terrace around the pool and luxury loungers. Pool floats also provided. Walking, hiking, tennis, sailing, diving and snorkeling available on the island. Spa services can be arranged at the villa. Please note events and parties are not permitted at the villa and guests are asked to be respectful of neighbouring properties. This is a quiet residential area which most of our guests appreciate. This home was built as the owner's primary residence and it shows. A marvelous open floor plan. The pictures do it justice. Driving on narrow roads on the "wrong" side takes some getting used to. Suggest a taxi tour of the island on arrival to get your bearings. Suggest taxis at night. "Best" restaurants are Sugar Reef and Fire Fly minutes from home. Mac's is the winner in Port Elizabeth. "Best" rum punch on the island is at Sugar Reef. Be sure to do the day sail to Mustique with GUSTO and take a tour of the island. Dive Bequia is great! This is an island to "chill", snorkel, dive or sail; no non-food shopping to speak of. Suzanne is EXTREMELY knowledgeable and helpful! Thanks so much! Beautiful villa and wonderful stay! We've stayed at some really nice places in the Caribbean but this villa tops the list! Inside and out, it is just beautiful, well equipped, and so many little details that make it truly special. Our host, Suzanne, could not have been more helpful, especially in helping us get from St Vincent to Bequia when we encountered some travel challenges. We arrived to find the kitchen stocked with some breakfast items, fruit and a wonderful meal (my son is still raving about "Suzanne's chicken"), which we really appreciated. The location in Spring was just right for us. We had a rental car as we like to explore. The drive into town was quick and roads were in pretty good shape, narrow and hilly, but if you've driven in the Caribbean before, you should have no trouble. 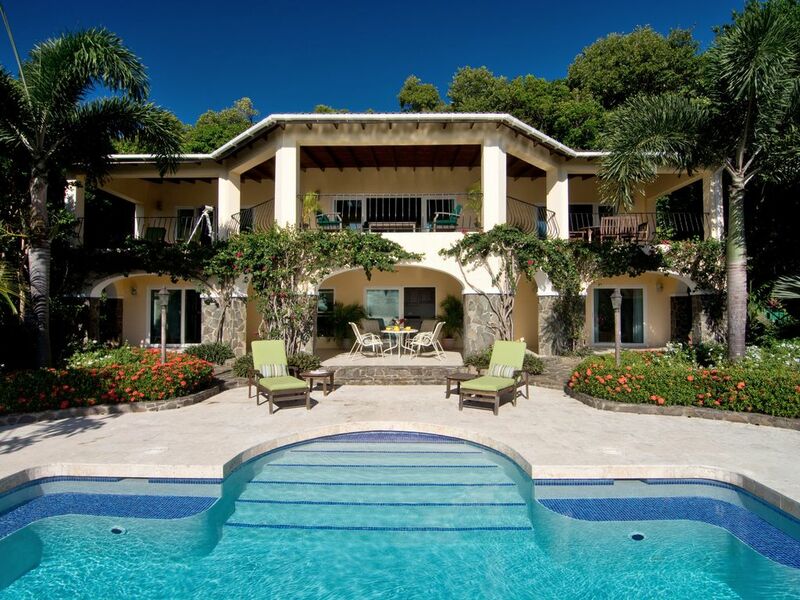 Highly recommend this villa and Bequia! Our honeymoon couldn't have been more spectacular!!! Wow. Amazing villa that is more beautiful than the photos! Our hosts were out of this world and when we missed our flight, Jim arraigned for his friend to fly us over!! Worth every penny and the flight was beautiful and entertaining with Bob the pilot!!! We'll be back for our anniversary, thank you for everything!!! Beautiful, tranquil, elegant home where you can truly relax. Everything you need is there. Thank you for taking the time to write a review, we are so pleased you enjoyed your stay at Bay Tree Villa. We had a great 2 week stay in May at Bay Tree Villa. The location to Port Elizabeth is about 2.5 miles and whilst we did walk into town a couple of times, local taxis were great for both to/from town rather than vehicle hire. The villa is exactly as described, with Suzanne and Tim on hand in the event of any questions. The pool and gym were used to the full and the amount of space for relaxing and dining (inside or out) was perfect. My husband and I have been traveling annually to the Caribbean for over 25 years; this is by far the most meticulously maintained villa we’ve had the pleasure of staying in. All of the furniture, including our bed was very comfortable and in extremely good condition. I love to cook and was thrilled to see the huge kitchen equipped with modern appliances as well as the outdoor grill all of which looked as if they were brand new. Surrounding the villa are beautifully lush mature gardens that open to a magnificent view of Spring Bay and the surrounding hills; it’s absolutely breathtaking! What really makes the villa special is the attention to detail taken by our hosts, Suzanne and Tim to ensure that our stay was perfect. Suzanne arranged for our rental car company to pick us up at the airport and drive us to the villa, leaving us with the rental on a SUNDAY at 6:30 PM! In addition to a delicious chicken and pasta salad waiting for us to enjoy after 10 hours of traveling, there was cold beer, bottled water, freshly baked bread, butter, eggs, and so much more for us to enjoy that evening and at breakfast so we didn’t have to leave the villa until we were fully rested. There was a binder with every imaginable bit of information you might need from resetting the clock on the oven to the best place for a romantic dinner. Seriously, this is the way renting a villa should be; of course we plan to return! Thank you Deborah for such a glowing review. We are pleased that you enjoyed our villa and appreciated the effort Tim and I put into the details which we think does make a difference to our guests experience. We look forward to hosting you again the the future at Bay Tree Villa. Beautiful beaches, day sailing trips. Fabulous location for stargazing. Bequia is also an undiscovered dive location with dive sites only 10 min on the boat... great for both beginners and advanced. 25% deposit required with balance due 60 days before arrival.